Inca Government Activity - HISTORY'S HISTORIESYou are history. We are the future. A fill in the blank title for this activity? Hmmmm. I’m intrigued. Since this activity has to do with government, start by thinking about what the job of government is. From History’s Essential Themes, you know that government has to do with how societies are organized. Now, think about the societies that you are a part - family, school, sports team, neighborhood… Okay, now think about the governments that those societies have in place - parents, principals, coaches… What is the bargain that the “government “ makes with individuals in their society? Individuals make commitments to their communities. In return, parents provide a place to live (and maybe a few other things, too), teachers provide an education, coaches provide opportunities to be better athletes. But, the benefits of being a part of those communities comes at a price. Have you ever heard a parent say, “If you can’t be nice and share that toy, I’m going to take it away?” The economist Milton Friedman famously said “There is no such thing as a free lunch.” What he meant was that even the things that are given to us - things that seem free - come at a price. In society, that price is often individual rights or individual liberty. The job of governments has always been to balance individual liberty with the security and safety of the society they govern. The Inca government was no different. For instance, in Inca society you gave up the freedom to choose your own profession. But, the government took care of all of your needs for you. Food, clothing, health care, shelter and security were all provided by the government. 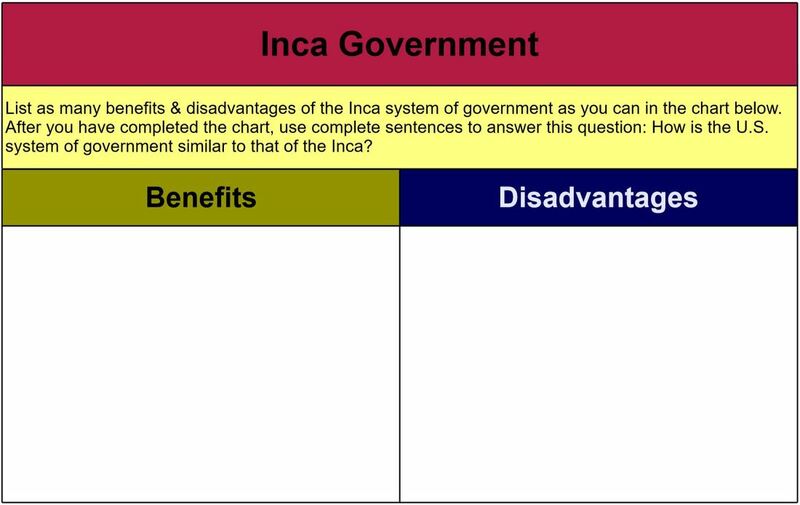 In this activity, you will begin by comparing the Inca system with our school system. Think about the roles played by each individual. In the chart below, list both the responsibilities of the individuals and whatever freedoms, or rights, they enjoy. Do students in this school - in this country - have any rights? Did common people in the Inca empire have any rights? Brainbox: What ​kind of relationship is there between "rights" and "responsibilities"? Answer: How is the U.S. system of government similar to that of the Inca?